Of course, I can't allow myself to eat store-bought granola, so I turned to my good friend Pinterest, and got a recipe. But not this one. I can't find the first recipe I used because I neglected to use Pinterest in the way it was actually intended and did not pin the recipe. So I combined what I remembered from that recipe with my friend Christie's Cranberry and Walnut Granola recipe and got this. 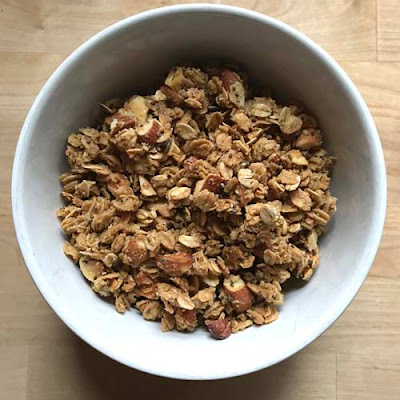 It's a good, basic granola with a good hearty crunch and just enough sweetness. There are some larger chunks and some bits of chia seeds and individual oats that are on the bottom of the bag, but it's all delicious mixed up with some yogurt and berries. Good stuff. I think I'll keep on having it for breakfast for a little while. Line a sturdy rimmed cookie sheet with parchment paper. Set aside. In a large bowl, whisk together the egg whites, canola oil, honey, vanilla extract, kosher salt, and brown sugar. Add the oats, almond meal, chopped almonds, and chia seeds. Stir to combine. Pour mixture onto parchment lined cookie sheet and spread evenly. Press down slightly with a silicone spatula. Bake at 300 degrees for 1 hour, removing from oven and stirring every 15 minutes. 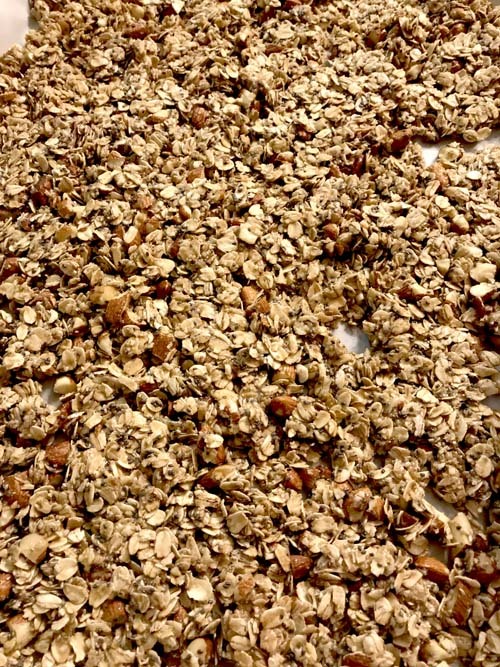 After each stir, press down slightly again to evenly distribute the granola. When done, remove from oven and allow to cool completely before eating or storing. Store at room temperature in an airtight container or large zip-top bag. Try to enjoy within about two weeks.